Perfect size for a family of 2 to 6 people! 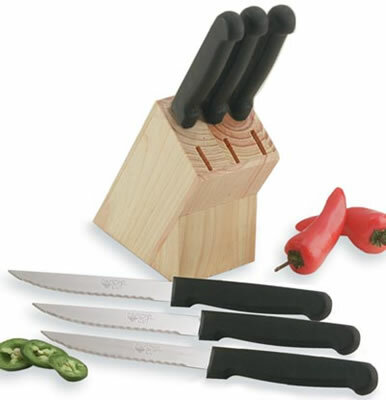 This attractive Diamond Cut 6-Piece Steak Knife Set with Wood Block offers 6 steak knives with 420 surgical stainless steel blades in a nice looking storage block for the kitchen counter top. 420 surgical stainless steel Produces strong, sharp blades that never need sharpening. Polypropylene handles Are easy to grip. Sturdy wood block Is cut with slots for "easy to reach" storage on kitchen counter top.